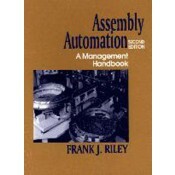 Success in automatic assembly design and operation comes from an awareness and sensitivity to a multitude of small design details, and only Frank Riley could pack so much knowledge and experience into a practical and authoritative guide to the selection and application of automatic assembly machinery. This book provides a thorough overview of management, engineering, and machine operator considerations necessary to ensure successful specification, procurement, design, manufacture, installation, and sustained productivity of new assembly systems. Places more emphasis on how corporations can employ an integrated systems approach to automatic assembly to respond to product quality, productivity, global manufacturing competitiveness, and increasingly aggressive consumerism. Includes a vast amount of practical information about all aspects of automated assembly. Thoroughly discusses several unusual and valuable topics, including a look into the 21st Century and the emerging influence of simultaneous engineering in manufacturing. Why Automatic Assembly? Product Design for Automatic Assembly. Selecting the Assembly Machine System. The Role of the Control System. Feeding and Transfer of Parts. Integrating Fabrication and Packaging Operations with Assembly. Joining and Fastening. Inspection, Gaging, and Functional Testing, Meeting Government Regulations. Systems Procurement. Machine Acceptance and Installation. The Production Audit. Automated Assembly in the 21st Century. Index.